One person I have admired forever is Tarla Dalal. The news of her passing, last year, was an utter shock. I have spent many years of my childhood reading her cookbooks, watching Cook It Up With Tarla Dalal and later, after the ease of Internet usage, learnt so many eggless bakes from her site. To know that the soft, happy, butterball of a genius isn't around anymore was, for me, a devastating blow. And it is on her site, that I found a recipe, close to what I wanted to make. R & I have been trying to eat healthy, protein rich and iron rich foods. In between 9 hour workdays, 3 hours in transit, frequent business trips and the sheer volume of double cheese pizzas we eat while watching Frozen on the computer, our diet is severely compromised in the health department. This needed to be done. Presenting my adaptation, and my tribute to Tarla Dalal, Methi Palak Mung Sabzi. 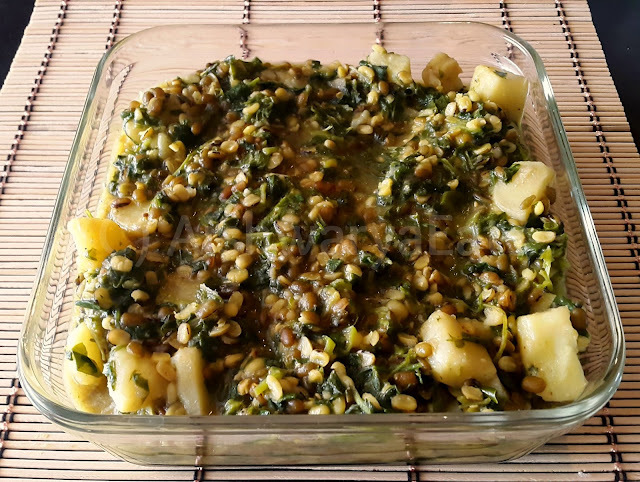 This is essentially soaked and boiled split mung dal, stewed with fresh torn spinach, fresh methi leaves, cooked with ginger, garlic, turmeric and cumin. It's like an Incredible India ad eh? :D Have it with rice, have it with rotis, or have it like a stew/salad with a squeeze of lime. It's super healthy, very little oil, and full of proteins, iron and fibre. Plus it's mad delicious! Wash the dal till the water runs clear and soak in salted hot water for 30 minutes. They should get significantly bigger at the end of the soaking. Pluck the spinach leaves. Try to avoid the torn leaves or those that have holes in it. Take it in a large bowl and fill it with tap water. Make sure all the leaves are submerged. Let it stand for 30 minutes. Rinse the leaves. Repeat the submerge-stand-rinse twice more. The last time, don't throw out the water, just rub the leaves in the water and place in a colander. Wash that under running water. Set aside to drain. Do the same with the methi leaves, except you can't rub each individual leaf in water (because they're too small!). So rinse them very very well in the standing water and running water. Chop up both the spinach as well as the methi. Meanwhile, while the soaking thing is happening, fry the potato cubes till they're crispy. Once your leaves are chopped, let's get down to business. In a kadhai, heat the oil. Once hot, reduce heat and add the jeera. Once it begins to splutter, add the garlic and green chillies. Fry but don't let it burn. Break the dry chilli into 2, and add into the oil. Add the haldi into this. Add the soaked mung dal. Stir well to combine. Tip in the greens one fistful at a time. After each fistful, stir it around to mix with the oil, then add the next fistful. The flavour gets better distributed this way. Now increase the heat and add warm water according to how soupy you want it. Remember the water will boil and dry so add accordingly. Add the salt into this as well. Now if you want the potatoes a little melty (like I did in the photo), add the potato now. Else, add it 5 minutes before you switch off the heat. If you feel the gravy is a little too thin, add a teaspoon of besan and mix well. Else, ignore. Turn off the heat, turn it out into a bowl, garnish with the julienned ginger and serve. And that's it. It's simple, albeit a little time consuming, but seriously healthy. Try it, I'm sure you'll love it.